Gas phase ion chemistry is a broad field that has many applications and which encompasses various branches of chemistry and physics. 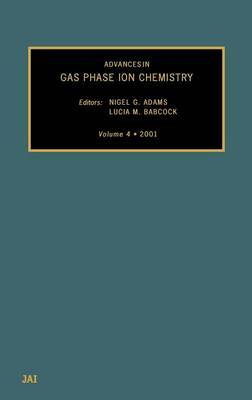 Advances in Gas Phase Ion Chemistry, Volume 4, describes innovative ways of studying reactions as well as the application of unique apparatuses to problems in this field. This volume contains a series of chapters, in the general area of gas phase chemistry and physics, which are at the cutting edge of research. The chapters are not meant to be general reviews, but focus on the author's own work. They focus on both experimental and theoretical work, which gives a balance to the volume. Applications are included to appeal to a wider audience and to broaden the knowledge of the more fundamentally inclined. An application to environmental pollution monitoring and medical monitoring of breath is included. With successive volumes, the coverage broadens to include more current research in the title area. The book is aimed at graduate researchers, university faculty and graduates in industry. The editors have made a specific effort to include contributions from those relatively new to the field, which brings in new ideas and perspectives, as well as those more established workers, who bring a wealth of experience.